About a year and a half ago I decided to grow my hair long again after having it extremely short for quite a while. My hair is now just below my shoulders and I've noticed it's becoming increasingly tangled. My precious hairbrush wasn't really dealing with tangles, it was pretty much just yanking the hair out of my hair, which could be quite painful at times. Noticing my hair was becoming a bit thinner than it's previously been so I decided to research some detangling brushes to ease my tangling issue and stop me pulling my hair out. 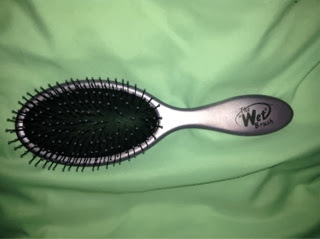 From reading many blogs I decided that either a tangle teezer or the wet brush were best suited for the job. As the wet brush was a traditional brush shape I opted for it as I believed it would be easier for when I tie my hair in a ponytail. I do in the future hope to purchase a tangle teezer to compare the to brushes for myself. I purchased my wet brush on eBay for €9.68 which I found reasonable considering a tangle teezer is €15 in boots. Some people may still think this was expensive for a brush but I've spent less on brushes and they have melted with heat styling so I find it beneficial to invest in my hairbrushes. I selected a purple one as it's my favorite colour and it arrived a week after purchase. I have to say from first use the brush has really impressed me. From detangling my wet post shower hair to detangling my hair after I've been out in windy weather it has had no problems. The wet brush doesn't tug on my hair as much as my previous brush did, in fact I barely notice it passing through tangles, it really does tackle them effectively. Usually after brushing my hair I would notice many extra hairs in my brush with the wet brush I've noticed considerably less. All in all I'm in love with this brush and would recommended it to anyone that's struggles with tangles in there hair.